Rhinomax Campers are pleased to announce the addition to our team Kellie & Michelle from “Melbourne Camper Trailer Centre” who have recently been appointed our new Melbourne dealer. 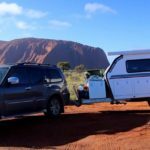 Kellie & Michelle have a wealth of experience in the off-road camper industry and have been involved with quality Australian brands for several years and we are extremely happy to have them on board. With the first of their display stock our hugely popular 10ft Scorpion Micro Hybrid already arrived and on show and the rest to follow in the next few months its a great opportunity to see Australia’s best hybrid camper range in VIC. 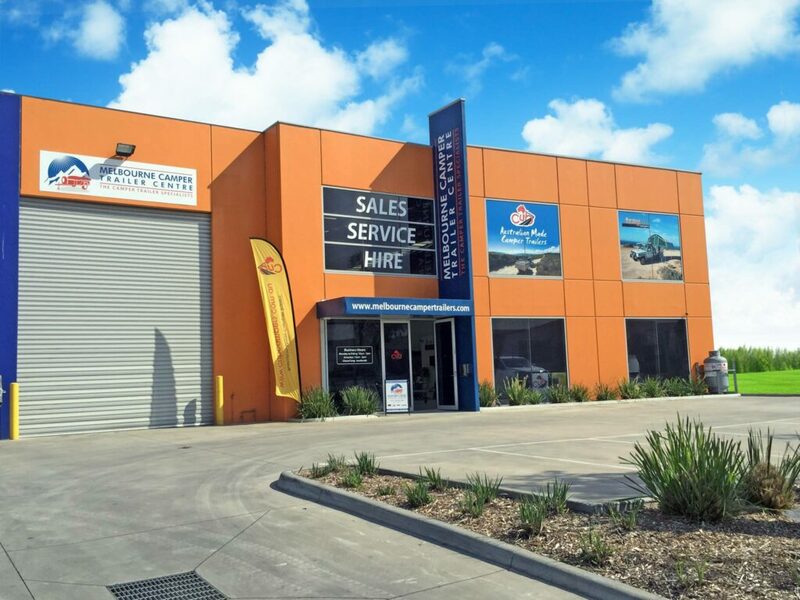 If you are in Victoria and would like further information on our award-winning range of hybrid campers, why not give Kellie and Michelle a call. 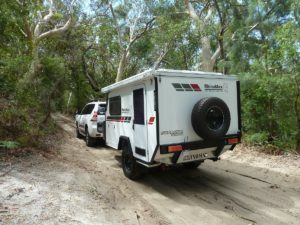 The Renegade 12ft Off-Road Hybrid Camper. After months spent meticulously designing, developing and engineering we are proud to bring to life what we consider to be the best camper in its sector. In this new model we’ve capitalised on the extra body space to include a larger 4 seat lounge dinette providing more spacious dining options. As-well as a rear drawer cabinet with a wide bench-top, an internal sink as standard and options for internal fridges or cooking etc. The Renegade features many of the luxurious elements of our larger models such as a full-sized queen bed, pop-up shower and a gourmet stainless steel kitchen. The Rhinomax team are excited to announce we are relocating to new premises. 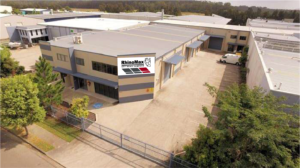 The new larger purpose built facility will enable us to deal with the ever increasing demand for our campers. 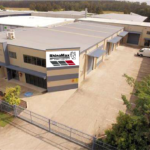 It also allows us to further streamline our production and service our customers better. Still keeping it local, we’ll be just down the road from our current factory. As of Monday 21st January our new address will be 9 Kerryl Street, Kunda Park 4556 and our new telephone number will be 07 5338 7240. Unshakable confidence – Decked out for long trips and offroading the Scorpion is a dependable battler that stays by your side no matter what. Ben takes industry legend John ‘Bear’ Willis from Camper Trailer Australia through the Rhinomax Scorpion 10ft Hybrid Camper. A complete run through of its features as well as a demonstration of its quick and easy set-up and pack-down. 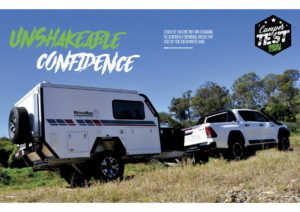 “The Scorpion has terrific off-road ability with its dimensions and strength, but come the end of a successful journey on a tough track and she transforms quickly into a flexible home away from home”. 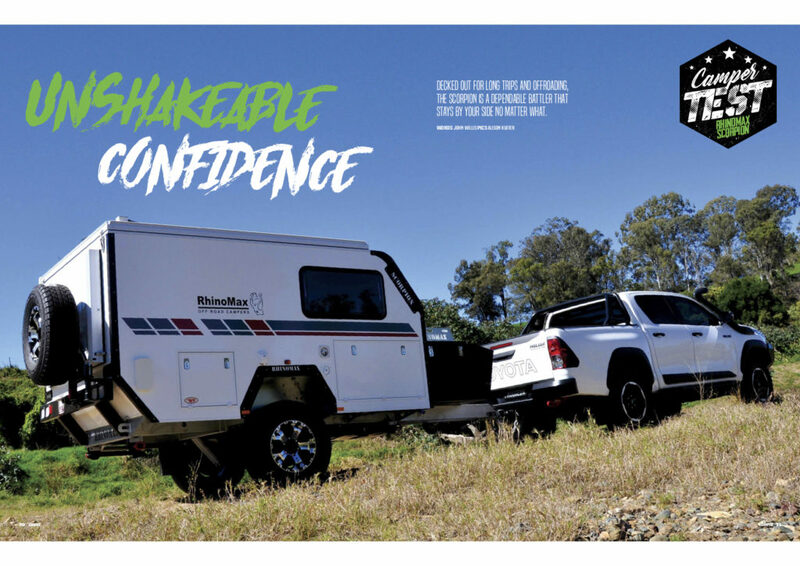 See why the Scorpion is a game changer in the luxury off-road hybrid camper range. Another great review for Rhinomax from industry legend John ‘Bear’ Willis. 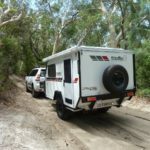 After taking the Discovery MK2 out for its latest review for the leading Camper Trailer Australia magazine John ‘Bear’ Willis fills you in on his thoughts. 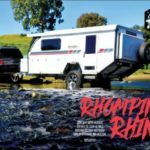 Rhinomax campers were designed on the Sunshine Coast with the purpose of providing adventurers an easy, comfortable and practical way to explore the Australian coast and outback. Each model is 100% off-road capable and tows behind most 4WD’s with ease. 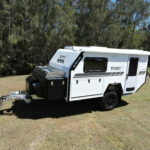 Because of their clever design and lightweight construction they are very well suited to beach getaways making gems on our doorstep such as Noosa’s North Shore, Double Island Point and the world-famous Fraser Island easy to access and the perfect weekend getaway. 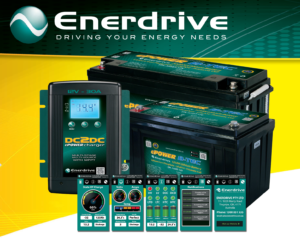 Rhinomax Campers have teamed up with Enerdrive Power Systems to offer an advanced Lithium power system incorporating smart phone technology and increased charging capacity giving you heaps more usable power enabling you to extend your time off the grid. 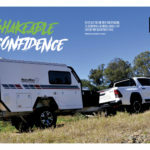 Whether you’re a veteran of the RV scene or you’re looking at getting your first caravan or camper trailer it’s likely that you’ve heard the tag line ‘Hybrid Camper’. 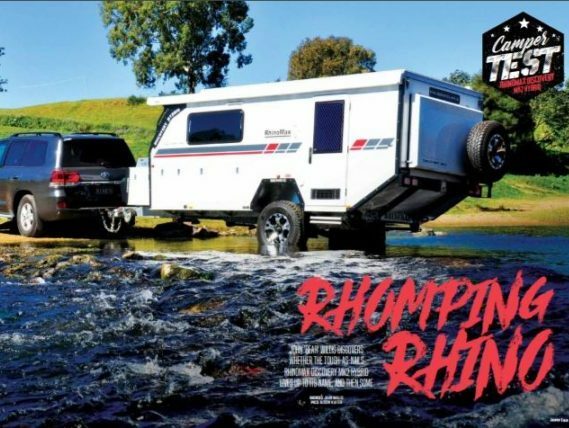 It’s getting thrown around a lot these days but what does it actually mean, what is a Hybrid Camper? 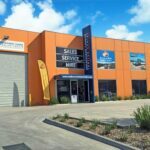 Often when travelling and touring there is a crossroad in the buying process that can separate people and limit the type of touring achievable. Do you go for the comfort and luxury of a caravan? 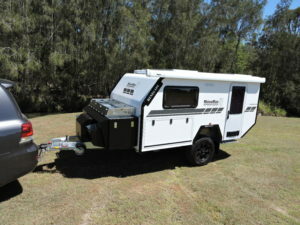 Or the ease of towing and accessibility of a camper trailer or slide-on? Both have their pros and cons, but at the end of the day it can feel like a compromise. 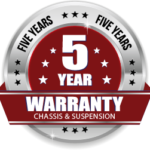 With our Rolls Royce engineering credentials Rhinomax Campers are renowned for producing one of the strongest chassis in the industry regarded by many industry experts as the best and all backed up by our industry leading 5 year warranty. 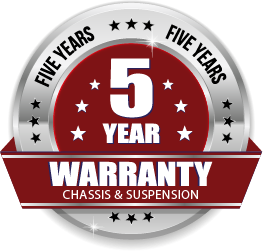 Riding on Cruisemaster suspension Australia’s best off road suspension system we are happy to announce this will now also be covered by a 5 year warranty giving you the peace of mind of extended warranty cover on two of the most crucial components of your camper.